According to the Pompeo doctrine, it is not a question of reducing world production to the level of demand per quotas of production, such as the OPEC+ has instituted for the last two years, but by closing the door on certain large-scale exporters – Iran, Venezuela and Syria (whose gigantic reserves were discovered only recently, and are not yet being exploited). The NOPEC project (No Oil Producing and Exporting Cartels Act) should therefore soon emerge from the archives. This proposed law, of which numerous variants were introduced to Congress two decades ago, is aimed at eliminating the sovereign immunity that the OPEP countries invoke in order to form a cartel, despite US anti-trust laws. It would enable the pursuance before US tribunals of all the state-members of OPEC+, despite their having been nationalised, for having profited from their dominant position, and would therefore influence the rise in prices. It so happens that, since the end of 2016, Russia has associated itself with OPEC in order to raise prices. It has thus agreed to diminish its production. This is all the more indispensable for Russia since its economy suffers from Western sanctions, and that the export of hydrocarbons – and also weapons – is one of its main sources of income. Consequently, in the current situation, the interests of Moscow and Washington do not hamper one another, but coincide to avoid flooding the market. This is why Russia does nothing to help Iran to export its oil, and still does not exploit the areas of Syria of which its nationalised companies have acquired the monopoly. It is also probable that it will not help Venezuela in this sector either. As a result, the transfer of the European headquarters of the PDVSA to Moscow has been postponed. 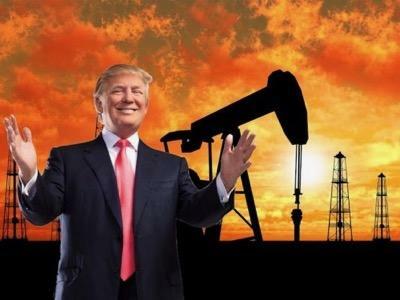 20 Comments on "The Geopolitics Of Oil In The Trump Era"
production increased last week, averaging 5.0 million barrels per day. imports averaged 98,000 barrels per day. barrels last week and are about 6% below the five year average for this time of year. inventories increased last week by 4.1 million barrels last week. supplied was up 0.7% compared with the same four-week period last year. gasoline, diesel, jet fuel deficits. doesn’t get refined. Ergo that top heavy crude inventory. This report will be seen as bullish by some but bearish by many uneducated headline only readers. Trump orders zero Iranian exports. Any bank caught doing bidness with Iran will be fined. It’s Lights Out Across Venezuela. This blackout began Tuesday evening and went until today (April 10th). Power was restored to most of the country Wed morning. The problem with unplanned outages is that they have a huge negative impact on production facilities without backup generators. In Venezuela, even major refineries often don’t have backup generators. Which means they have to do unplanned shutdowns. Startups after unplanned shutdowns can require several days to recover from. The IMF also issued new cautions about Venezuela. They now think the Venezuela economy could contract as much as 25% this year and that they will suffer 10,000,000% inflation. Unemployment is expected to be near 50% for 2019. In 2020, Hugo Chavez’s Socialist agenda will be on year 20. The net impact is to destroy the manufacturing sector, destroy the farm sector and even the oil industry in a country with the worlds largest oil industry. Hugo’s socialist agenda has also brought social disruption causing the most educated workers, doctors and business owners to leave Venezuela. It has caused millions of Venezuelans to flee Venezuela. There is reports that over half of the remaining Venezuelans would like to flee Venezuela for other countries but lack the resources to flee somewhere that they would be accepted. Could someone please tell me the on-the-ground difference between one million P/C inflation and ten million P/C inflation? Some states are using authority under the Clean Water Act to block fossil fuel pipelines and infrastructure. President Donald Trump will sign an executive order that seeks to limit states’ ability to delay construction. The same executive order contains several other provisions to promote energy infrastructure development. Plastics are killing the oceans (New Continent Found – Garbage Gyre II). almost nothing to do with reality. Daily we read how peaceful demonstrators are jailed (or worse) named as ‘terrorists’. tried to circumvent T titles by forging an actual State, with flags, currency, the works. Its always been true, kill under the flag of a powerful country or religion and your good to go. The other day Trump named Iran’s Republican Guard ‘Terrorists’ to help Netanyahu get reelected. Although that breaks w/ the entire meaning of ‘terrorism’ everyone bought the concept. It worked too. I don’t know what is untrue about the plastics in the ocean or that those plastics are being made out of oil. “What is plastic made of? Around here the Price of a gallon of gas is almost $3.00 and rising. “Plastics are everywhere. While you’re reading this article, there are probably numerous plastic items within your reach (your computer, your pen, your phone). A plastic is any material that can be shaped or molded into any form — some are naturally occurring, but most are man-made. Plastics are made from oil. Oil is a carbon-rich raw material, and plastics are large carbon-containing compounds. They’re large molecules called polymers, which are composed of repeating units of shorter carbon-containing compounds called monomers. Chemists combine various types of monomers in many different arrangements to make an almost infinite variety of plastics with different chemical properties” (How Plastics Work). Plastics, in the larger context, are made from fossil fuels. “There are three main fossil fuels: coal, petroleum and natural gas.” (What are fossil fuels). Plastic is made from fossil fuels. (How Plastic is made from Natural Gas). Note, this was posted by a congressman! Why should that be noted? Congressman are about as low as you can get in believable reality but that is what you look for cloggo. Sorry for pointing at facts, empire dave, shouldn’t have done that, I know how much you hate facts. Facts are so anti-American. Last man standing, honest, there you go. The British get until Halloween to pack their bags and leave the EU. Apparently Macron was able to prevent an open-ended “flextension”. Perhaps this Halloween date was intended to tease the British and force them to prepare for the upcoming EU-elections, in order to leave a few months later. Anyway, yesterday in BBC Newsnight, a Euroskeptic Brit predicted that by the end of May nobody talks about stupid Brexit anymore. The real significant fact will be that up to 1/3 of the parliamentarians will be populist. We’ll be living in a very different world by then. The empire is toast. The Americans will become the hunted in stead of the hunters. All the populists want to include Russia into Europe, even Macron said as much. He knows that he, Putin and a Merkel-follow-up, with 640 million citizens, will be presiding over the first political and civilizational entity in the world. We’re going to liberate white America back, after the Chinese will fire the opening salvo in the South China Sea. “Don’t be so mean to the British”, the wannebee new British dog-owner barks against the evil Yuropeans. That’s OK Don, you can have them (minus Scotland and your golf courts), we’ll take Russia and its nukes. Goodluck with your wall, your darkies, your looming CW2. Deal? …and will be tempted to let May drown in her Brexit chaos and the ERG Alan B’Stards with her. Expect 6 months more political paralysation. What division of Oil-Qaeda persuaded you of your error (Oil-Qaeda & MOMCOM Conspire To Commit Depraved-Heart Murder – 5)? The bottomless pit of oil division? Syria is not a major oil producer. It never was and Iran has far more natural gas reserves than oil reserves. We barely produce enough natural gas to meet our needs and we are still a net oil importer. There’s no way we can have much of an impact, the way things stand right now, on global energy markets. We barely produce enough excess natural gas to supply one maybe two Baltic countries. I don’t see Russia quaking in it’s boots over this and I don’t see the Germans being stupid enough to back down from our stupid demand that they not build Nord Stream II. They know Russia has the world’s largest proven natural gas reserves. If this is really the thought process going on in Washington, which I do not believe, they are even more stupid by far then I thought they were.